HTML5 & CSS3 Website Templates New! What’s the best way to create a business website? New! Learn how to create a website using HTML and CSS Styles. Below is the preview of the CSS website you will learn to create. All the above Areas defined above are contianed inside a div with id wrapper . Define this <div id= wrapper > just after the starting <body> tag. The CSS code for <div id= wrapper > is to give it a Blue(#1D4D6B) background color. This background color gets applied to all the elements which are contained inside this wrapper div. Let's start with the Header Area. 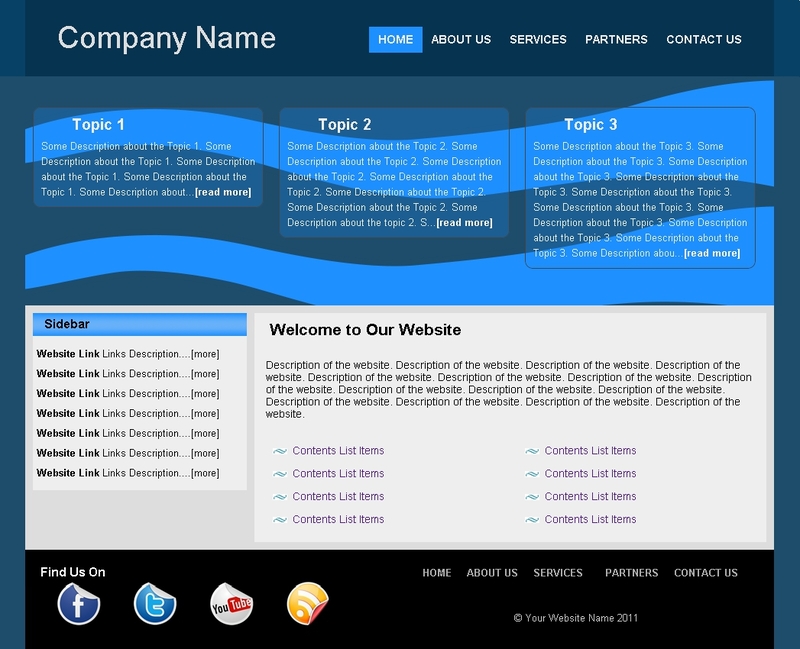 The Header Area consists of the Company Name and the Main Navigation Menu. This Header is made using only four div elements. › Left Header and Right Header div contained inside the Center Header div. › The last div is the Main Header div that contains all the other three div's inside it. The Header Area has two background colors. The lighter shade of blue color applied to the <div id= header >. The darker shade of blue color is applied to <div id= center_header >. This div is positioned at the center of the webpage horizontally using the auto margin property. Now we'll make the text Company Name big and the menu hover effect usign CSS styles. We'll add some space between the menu links using the padding property. → Applies a dark shade of Blue(#074266) to the div with id header . → To set the more darker Shade of Blue(#053350) to the div with id center_header . → Sets the height of the center_header to 100 pixels. → Centeres the center header div horizontally . → Margin auto wont work if width is not specified. → Sets width to 980 pixels. → Floats the left header div to the left. → Set the font size to 40px to all the text inside left Header . → To position the text in the middle (vertically). → To position the text in the center (horizontally). → Sets width of the left header div. → Floats the menu div to right. → Sets the height of menu div. → To position the div at the middle (vertically) inside the center header div. → Sets the width of menu div. → Sets the text color to Light Cement(#EEEEEE) Color. → Sets the font size. → Makes the text look little bolder. → To provide space of 12 pixels between two links and 8 pixel spacing at the top and bottom of the link. → Changes the background of the links on mouse hover. → This is the image used. The Preview Area contains three transparent boxes. These boxes show some part(3-4 lines) of the complete topic and have a [ more ] link that links to the original topic. The transparency is applied using a transparent image. The three preview boxes are contained inside the div with id center_preview , and center_preview div is contained inside preview div. Each preview box has an id topic . Some Description about the Topic 1. Some Description about the Topic 1. Some Description about the Topic 2. Some Description about the Topic 2. Some Description about the topic 2. Some Description about the Topic 3. Some Description about the Topic 3. Some Description about the Topic 3. The Preview Area and the three text boxes have a background image. The text box background image is a png format. The image can be made more transparent using image editors. Only png and gif formats support transparency without using CSS. The jpg format does not support transparency, but it can be made transparent using CSS Opacity Property. → Sets the height of the Preview Area. → Sets the height of the center_preview Area div. → Sets the width to 980 pixels. → To center the div horizontally. → Sets the transparent png format image background . → The image is repeated in both direction by default. → Sets the width of topic div to 300 pixel. → To align the div horizontally. → Sets the font size to 13pixels. → Sets the spacing between the preview div and the topic div. → Sets 1 pixel border to the topic div. → Border radius Property for all the browsres. → It makes the corners round in shape. → To change the default width for the H2 tag of 100%. → To move the text inside the H2 tags to the right. → To provide space between the text and the container topic div. → Sets the line height for all the text inside the p tag. → Sets White(#FFFFFF) color text for the links inside the topic div. → To increase the boldness of the link text. The Content Area has a Sidebar on the left that contains links to other pages. The div on the right is the main content box. of the website. Description of the website. Description of the website. Description of the website. → Sets the height of the container to 320 pixels. → Sets Light Grey(#DDDDDD) color to the background. → Sets height of center_container to 320 pixels. → Sets spacing only on left and right side of the center_container . → To position the div at the center Horizontally. → To position the sidebar div on the left side . → Width of the sidebar div. → Creates spacing of 10 pixels on each side of the sidebar . → For spacing between the text and the sidebar div at the bottom portion of the sidebar . → Lightest Grey(#EEEEEE) Color for the background color. → Sets Line Height to 30 pixels for the text inside the title div. → To create spacing on the left side of title . → The spacing values for top, right, bottom is zero pixel. → For spacing between the title div and the text inside the sidebar ..
→ Sets font size to 16 pixels. → To make the text bold style. → A 12 X 30 pixel image is repeated along x-axis for the background. → The padding, line-height are affected by the background image. → The margin is not affected by the background image. → Removes the bullet listing style. → Sets the width of the ul html element same as the width of sidebar . → For spacing between two li elements on all sides . → Reduces the font size to 13 pixels. → Sets the text color of all the anchor a elements inside the sidebar div to Black(#000000). → Sets width and height of the content div. → For spacing between content and the center_container on top,right and bottom portion. → Sets the background color. → Sets the font size of the text inside the content div. → To align the content div on the right side of center_container div. → Sets spacing on top, bottom and left side of the h2 tag element. → To provide spacing between p tag element and content div. → To align the left_list and right_list horizontally . → Provides spacing between the left_list , right_list and the parent content div element. → The values are applied clockwise starting from the top. → Replaces the bullet style with an image. → Sets the height of all the anchor a tags to 30px. The footer area is made usign two div's. The left footer area contains the links to the social network sites. The right footer area contains the footer menu and the copyright information. The footer div contained inside the wrapper div has a dark blue(#1D4D6B) background shade. The center_footer div contained inside the footer div has a black(#000000) colored background. We'll position the Social Networking icons inside the <ul> </ul> tags horizontally. → Sets the height of the footer div. → Sets Black(#000000) Colored background for the center_footer div. → Width and height of the footer. → Works with the width to position the center_footer at the center horizontally. → Sets the widht of 450 pixel for both left_footer & right_footer div. → Padding space inside the two divs. → So the divs position themselves in single row horizontally. → Sets White(#FFFFFF) color for all the text inside b tag elements. → To stack the social networking icons to the left side of the webpage. → To set the spacing between the social icons. → Width and height of the social networking icons. → To position the right_footer div to the right side of the footer div. → Sets the color of all the links in the right_footer div. → For Spacing between the links . → Sets the line height of the links. → Sets the font size of the links to 13 pixels. → To make the text look bolder. → To make Light Grey(#CCCCCC) Colored text inside any span element that exist in the footer div. → Sets the fonts size to 13 pixels. → Positions the text inside span element 150 pixels from the left. Looking for high-quality Responsive Website Design? Choose from over 2000 templates!